Join this gulet cruise and you will have a holiday where you can relax while admiring the beautiful bays and fabulous old towns of Montenegro. There are plenty of opportunities for swimming and relaxation, visiting several coastal towns like Kotor, Perast, Budva, Herceg Novi and Tivat or enjoying a drink from the boat’s bar. Kotor Bay, the deepest fjord (Actually a Ria, a flooded river valley) in the Mediterranean, is an absolutely stunning fjord-like bay with steep sides plunging into the glassy waters dotted with tiny islands that often have a single church or just a few buildings clinging to them. Budva is a medieval walled town, but one with beaches and a thriving nightlife. 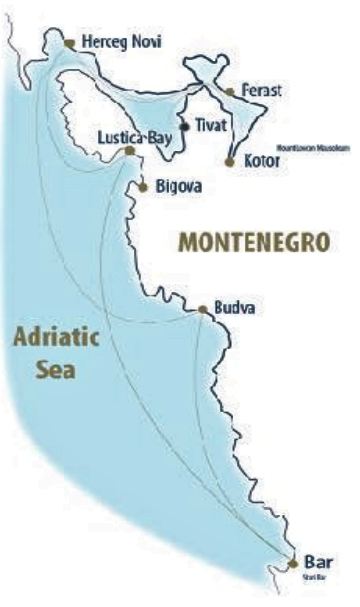 Greece, Rome, Byzantium, Ottomans, Venice, The Austro-Hungarian Empire, Italy and Yugoslavia all claimed Budva at some stage before Montenegro achieved independence in 2006. We will also visit the beautiful ports of Bar, Lustica Bay, Herceg Novi and Perast. There are canoes and paddle boards on board for your use. You will be transferred from the airport (Tivat, Dubrovnik or Podgorica) to the harbour, where embarkation begins at 17:00 h. Get settled in your cabin before welcome drink. Dinner onboard for the first night. Overnight at anchor. Our first visit will be the Maritime Heritage Museum, where we can learn out Tivat and its naval history. We will sail into magnificent Boka Bay and stop for lunch and swimming in Ljuta Bay. We will arrive early at Kotor Port -, Kotor is an UNESCO World Heritage site. The town is a maze of medieval streets, museums, churches, cafe-strewn squares, Venetian palaces and pillories. Enjoy dinner at one of many restaurants in Kotor. Overnight at dock/anchor, depending on availability. After breakfast we have a city guided tour of Kotor Old Town. We will sail out of the bay heading south with a swim stop in Dobra Luka Bay and lunch onboard. Before we arrive in Budva we will stop at the popular sandy beach at Jaz. You will have the rest of the day to explore Budva, one of the oldest settlements on the Adriatic coast, over 2,500 years old. Budva has some beautiful Christian architecture and some of the most amazing churches in this part of Europe. Dinner out and overnight at anchor in Budva. After breakfast we will set sail for Bar, stopping for lunch in front of Sveti Stefan, a fortified island village. In the past this was a favourite hangout of 60’s film stars and royalty like Sophia Loren, Doris Day and Princess Margaret. We will have a pleasant walk from Sveti Stefan to Przno through Milocer Park. Before we arrive in Bar we will stop for afternoon swim in Maljevik Bay, a small quiet bay. Your evening is free to explore Bar. Overnight at dock. After breakfast we head inland for a guided visit of Lovcen National Park. After a scenic drive, we will arrive at the summit of Mount Lovcen and visit the Mausoleum of Njegos, a hugely important historical figure. We descend slowly so we have a chance to admire beautiful Boka Bay. We sail out and enjoy lunch onboard in Mirista Bay. Here you can swim and explore the famous Blue Cave, before arriving in the next port, Herceg Novi. There is plenty of time to discover Herceg Novi, far from the madding crowds. Stroll through the streets, explore the old buildings and churches, check out the fortress Forte Mare and enjoy the atmosphere and the history. You are free to dine at one of the lovely local restaurants. Overnight at dock/anchor, depending of availability. For our last day we sail into Boka Bay and stop in Risan Bay for lunch onboard. Risan is famous for the remnants of classical culture. Upon arrival to Perast, will will stop at Gospa od Skrpjela (Lady of Skrpljel) and St George, tiny islands with churches. You can’t miss out on St. Nikola church in Perast where you can admire a stunning view from the top. Tonight, enjoy captain’s dinner onboard. Overnight at dock. Early morning sail to Tivat for disembarkation at 9am. Breakfast on board. Transfer to the airport. Sadri Usta is 32 metres long gulet ketch and has 8 cabins, 6 doubles and 2 twins. She was built in 2005 and extensively refurbished in 2017. The 4 crew members, the captain, chef, steward and sailor, look after a maximum of 16 guests. Double beds measure 1.5 x 2 metres, and twin beds are .8 x 2 metres. All cabins have ensuite facilities and air conditioning. There are 2 canoes, 2 paddle boards and some snorkelling gear for passengers to use. In the beautiful wooden lounge there are USB charing ports and a selection of games. Sadri Usta also carries an inflatable dingy with outboard motor. 15% off Montenegro gulet cruises booked before 31 January 2019. Next departure on 05 May, 2019. Join this gulet cruise and you will have a holiday where you can relax while admiring the beautiful bays and fabulous old towns of Montenegro. There are plenty of opportunities ......click here to read more.